Every time I look at panel 1, Ril’s anatomy just looks wrong, because with human hands, those thumbs would be on the wrong side. But Ril has two thumbs on each hand, one on either side of his two fingers, so the anatomy is actually right for him. It just looks weird though when you’re so used to human hands. I think this page is a good place to mention the effectiveness of using a light snow dusting as a coloring effect. When I first started coloring the characters in the snow, starting way back with the cover to The Big Snow Job #1, I found that the characters colored normally without any effects just didn’t look right in the environment. They stood out too much and felt “removed” from the surroundings. I found that adding a slight dusting of snow on their shoulders and heads, and especially on their legs and feet, really helped tie them into the surroundings. It’s just one of those very minor details that, on some subconscious level, I think your mind registers. Something that’s been out in the snow for a while that has no snow on it comes across as “fake” and even if you aren’t consciously aware of it, some part of your brain picks up on the discrepancy. 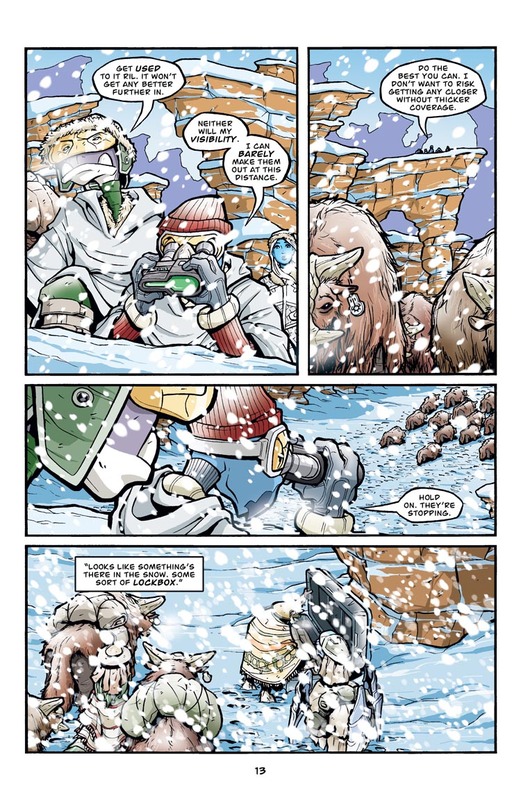 Anyway, on this page, I added that snow dusting to various parts of the characters’ clothing, as well as the top parts of all the yak, to make the characters fit the environment that they’re in. I got the same reflex about Ril all the time, damn E.T! I think you can go further with the snow and actually draw patch of it on their shoulders, that will accentuate the fact they are been waiting there for a while. Love this page great work!